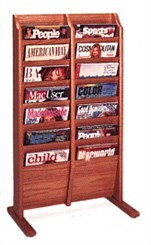 Single or double column racks hold magazines and catalogs. Solid oak and ash frame construction with matching laminate dividers and backs. Satiny smooth lacquered finish. Order the double column 14 Pocket Freestanding Magazine Rack here as No. Y1016; order other sizes below. 20-1/2"W x 3-3/4"D x 37"H overall. Shpg. wt. 30 lbs. PRICES INCLUDE FREIGHT! Please allow 1-2 weeks for delivery. 1 - 2 $94.00 ea. Same as above except with 7 pockets in a single column. Overall 10-1/2"W x 3-3/4"D x 37"H. Shpg. wt. 14 lbs. PRICE INCLUDES FREIGHT! 1 - 2 $124.00 ea. Same as above except with 10 pockets in a single column. Overall 10-1/2"W x 3-3/4"D x 49"H. Shpg. wt. 16 lbs. PRICE INCLUDES FREIGHT! 1 - 2 $189.00 ea. Same as above except with 20 pockets in a double column. Overall 20-1/2"W x 3-3/4"D x 49"H. Shpg. wt. 34 lbs. PRICE INCLUDES FREIGHT!